Home / Conventions / 2016 Nashville / Alexandria Harmonizers to present selections from I Am Harvey Milk at ConventionBecome A Member! After a successful and highly rewarding performance of this powerful piece, Musical Director Joe Cerutti shared some closing thoughts about the experience. Read the full reviews here, here, and here! Excerpts from the work will be featured during a HU class at the Nashville Convention for those who would like to learn more about the experience and how other ensembles might look for collaboration opportunities. 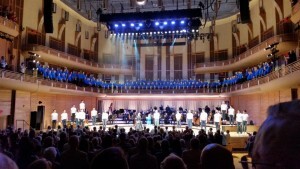 While the subject matter is mature and contains strong language and adult themes, our purpose in presenting this discussion is to explore the possibilities when barbershop ensembles such as the Alexandria Harmonizers break into the professional music world and showcase our ability to perform at the pinnacle with the very best. Viewer discretion is advised; attendance by minors is not recommended. Barbershop and… difficult, mature themes? Aren’t we supposed to avoid that? To be clear, this is not really a “barbershop” performance. “I Am Anne Hutchinson/I Am Harvey Milk” is a contemporary oratorio which calls for a male chorus. The programming of this discussion is not intended as a debate or endorsement of the suitability of this material to a barbershop stage or audience. Themes of social justice, inclusion and collaboration are common throughout contemporary choral music, and we will continue to encounter it in settings outside the barbershop stage. ← You can help spread Barbershop in France!